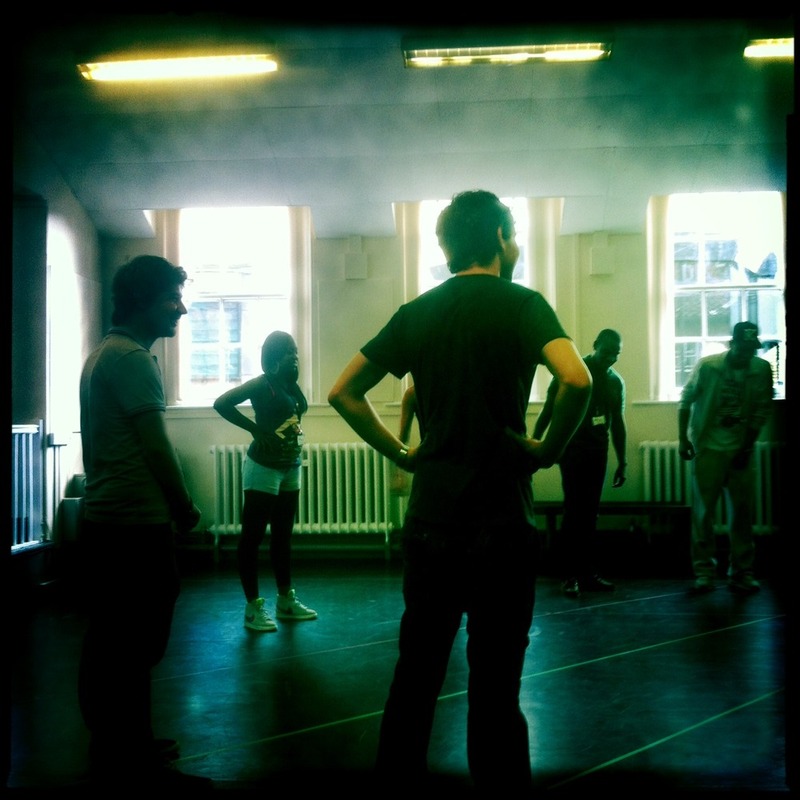 Roy Williams is with us in rehearsal for the first week which is great news. 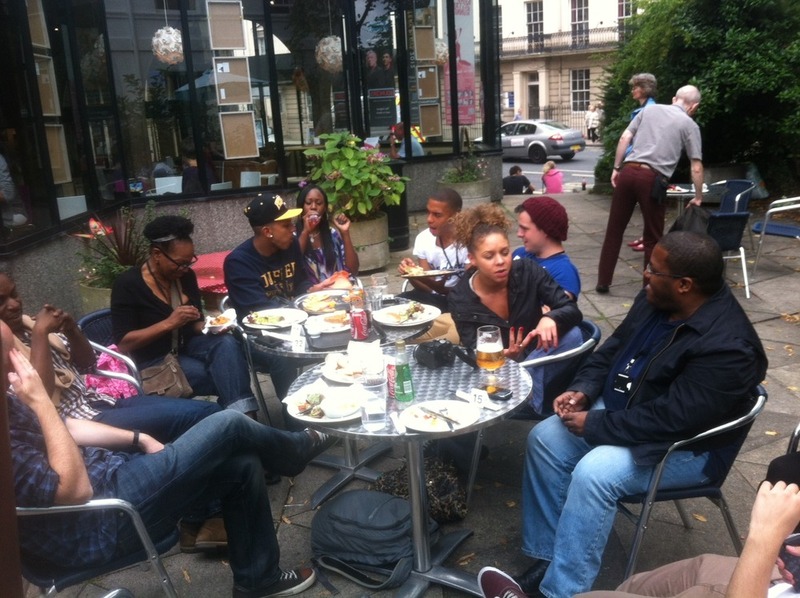 A quick snap of the cast after the rehearsal session on characters and impro, taking time out with some food and chat at York Theatre Royal where we are rehearsing. This is an exciting time for us here at Pilot Theatre – and already there is a good buzz in the building and in the City about this new project. 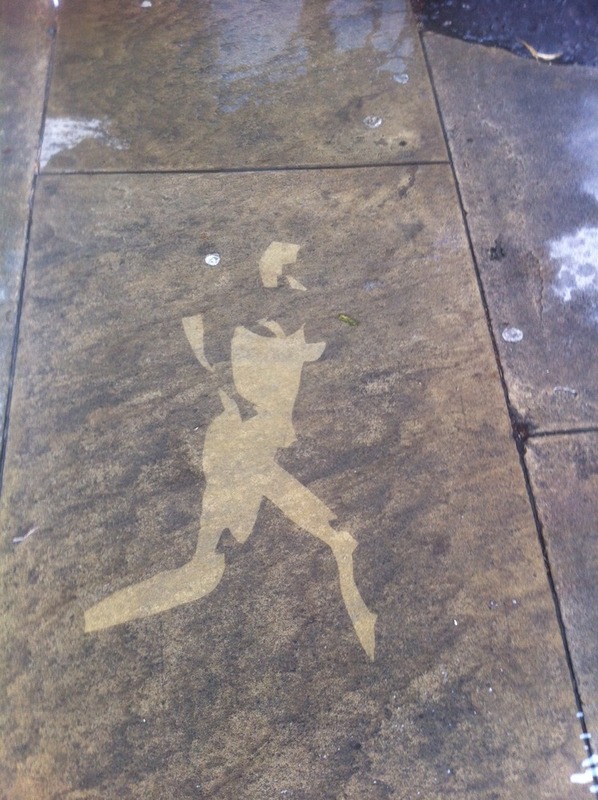 The Loneliness of the Long Distance Runner – Day three – bring it on! A day of readthrough / Guardian Interview / rehearsal / and meeting the whole team for The Loneliness of the Long Distance Runner / Pilot Theatre’s new show. Great to have the writer Roy Williams with us all week – and to welcome the actors on board who gave the best readthrough of any new play that I have ever heard. In The Space everyone could hear us stream??? On Saturday August 11th at 7pm Pilot Theatre went live on the new BBC/ACE site (Thespace.org) with 6 camera feeds, three audio feeds, full transcript and it was available on all internet enable devices – computers, tablets and smartphones. This had been developed with our digital partners, Kinura, who had written the new code that could enable anybody watching to shift between the camera views and for there to be no audio timelag as each camera was running through its own individual encoder that allowed the dialogue to be in sync. The project we worked on was the York Mystery Plays, which involved over 500 people onstage for each performance and took place in a 1400 seat specially constructed arena auditorium in the grounds of St Mary’s Abbey York. So what did it look like? As you can see you can select your camera from the row of 6 thumbnails and make this your main player – here the understage camera 6 has been selected. c) The live audio described feed. select any of the thumbnails to be your main point of view. The views allowed full coverage of the stage action. These provided wideshots, close-ups and focusing on areas of action like the choral singing or the band. To do this there were 3 robot cameras with operators (the same ones as used for the Olympic coverage), 2 onstage cameras with operators and special ‘Livepack’ roving camera under the stage with an operator. This is a camera attached to a backpack with an encoder and basically lots of 3G upload ability – a bit like having a rucksack full of smart phones all working in sync to upload the live footage for you. All of the cameras were HD and recorded all the material onto a vast storage system. We recorded 6 cameras, four hours each – which is actually 24 hours of HD video. On top of this you could choose which audio feed you want to hear. The stage action, with all the dialogue, singing and performances, or you could choose the production and cans feed from the DSM calling the show. Here you could hear all the cues, set ups and action points whilst watching the results as they happened live. Or you could have the audio described version of the events that are happening live on stage. So you can access all areas throughout the performance. The idea came from when I was watching a show in the main house at York Theatre Royal – and realising of course that you are free to watch wherever and whatever you want – be that the follow spot operators, the audience, the action downstage right – or the lighting changes. So as a next iteration of the idea of live performance we wanted to recreate this idea using multiple camera viewpoints. So as a difference from say an NT Live stream where the decisions to which shot you will see have already been predetermined by a director – in our work you are the one who chooses and this gives a greater sense of creative intervention and participation in the event. So. This is not about making a programme, or an edit that is made for you. This is different. This is new. You make the choices. You decide what to watch, what to listen to, and above all you decide how you want to engage with the work. 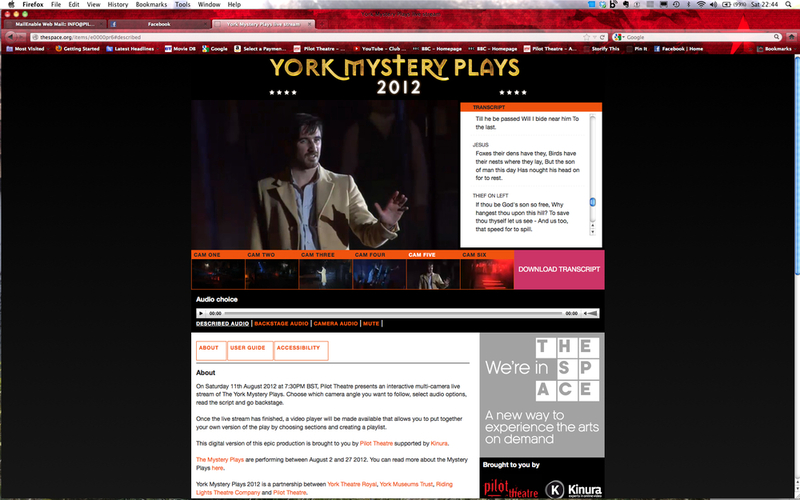 This is just the start of the project – after the livestream – the footage will then still be available on the space site from September 3rd – where the view again option is still available – only now you will be able to drag and drop from the clips available into an audio timeline so you can choose your own bespoke version of the York Mysteries, by mixing the clips from the 6 cameras into your own version to watch back. Which is what this project is all about. The next iteration of what iplayer might become, the interaction, participation and creative involvement of audiences, viewers and collaborators. Did it work? Yes indeed. We never lost any transmission time, and we maintained the full feed on all 6 cameras for 4 hours with a hitch. The feedback online was amazing – we reached 237,000 twitter accounts using the #mysteryplays hashtag. spaceHD from Pilot Theatre on Vimeo. On Saturday August 11th at 7pm Pilot Theatre will be presenting something that has never been done before. Ever. We are presenting this on The Space. We have been working with Kinura to develop this idea. They have written new code. This has been integrated into the BBC/ACE Space website. We go live from 7pm Saturday. You can select your camera from the row of 6 thumbnails and make this your main player. You can read the transcript of the text. You can select any of the thumbnails to be your main point of view. You can change these at anytime. The views allow full coverage of the stage action. Three robot cameras with operators. Two onstage cameras with operators. We also have a livepack roving camera under the stage with an operator. Which captures the backstage action. You can watch and interact with this live from a device connected to the internet. For free. So we will be capturing 6 camera feeds for four hours. A total of 24 hours of material. This will then be made available – again on the Space from September – where you can remix / re watch / your own bespoke version of the event. In your own time. By dragging clips into an audio timeline you can re visit and choose you own viewpoint version. So. This is not about making a programme. Or an edit that is made for you. So join us. be part of the story. Let us know what works for you. It is how we will all learn how to make things work better. Today I made a leap – right into the deep water today. 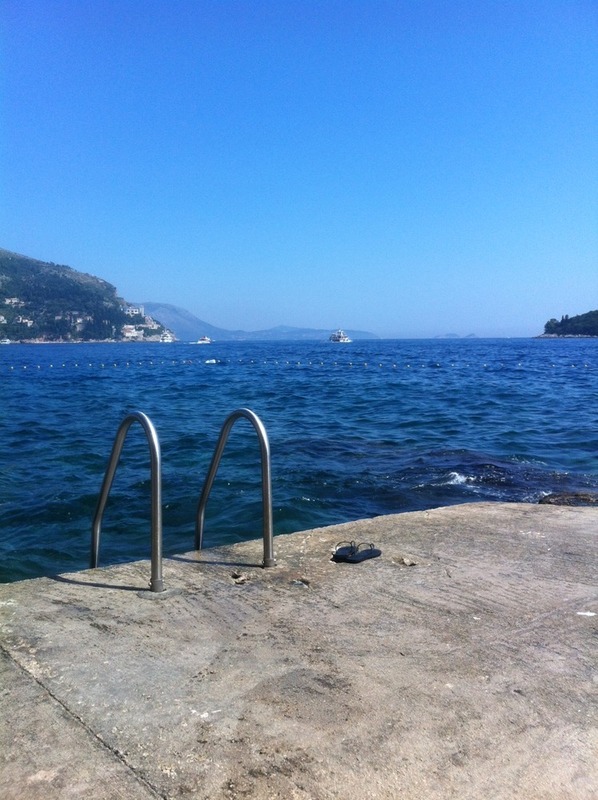 From here right on the edge of Grad Dubrovnik and straight into the salty Adriatic. More importantly I have been making notes and jotting down thoughts about work and plans. It has been great to take the time to think and I appreciate that this makes me very fortunate indeed. The great thing about working for Pilot theatre is seeing the range and skills of the team blossom and develop. Since taking a break from the office a fortnight ago – lots has happened. Our associate directors Katie Posner opening the York Mysteries with the whole team after months of real graft and hard work – is fantastic. Tom Bellerby opening two shows in Edinburgh and getting great reviews is brilliant – and this comes on the back of his European show opening in the Czech Republic. – and bringing the touring team for Long Distance Runner into the Pilot Team. As well as steering the needs for The Space with York Theatre Royal team. Not to mention Mark Beasley who has been bridging the whole Space and Kinura and BBC production project to fruition and developing all his Digital Production skills from PilotLive to the forefront on this. The marketing and press teams too have been uploading images and av stuff into the Dropbox for the BBC. As well as thinking – I have realised that what we have created with the company is an opportunities hub and a seed bed for creative talent – which is an exciting place to think and make work. The understanding too, that as with the development of the athletes for team GB we too, in our own way, have spent out own time developing our team of artists and players with their own skills and abilities. This has taken time and resources – but the range and diversity of our projects makes me very proud indeed. So we have new projects in the pipeline. We have a new Chair starting to work with us – and I for one am looking forward to diving back into the work tomorrow – feeling refreshed, invigorated and above all excited. A long day today – but a good one – an early start and a trip to catch the ferry from Supetar on Bra?? – across the Adriatic to Split. From here a bus to Dubrovnik which is a 6 hour trip down the Dalmation coastline to the Unesco World heritage city of Dubrovnik. – you drive on for three minutes then do the same again. We passed signs and roads to Sarajevo and Mostar and indeed we crossed the famous river. We crossed several rebuilt bridges and saw that some of the landscape still bears the scars. We were the only English people on the bus which made regular stops at working towns and depots along the way. A great way to travel and to take in the atmosphere of Croatia today – and being out of email contact was great. It allowed me to sketch out a new storyline and plot for a new project. A real focused amount of thinking time – which was rewarding indeed. 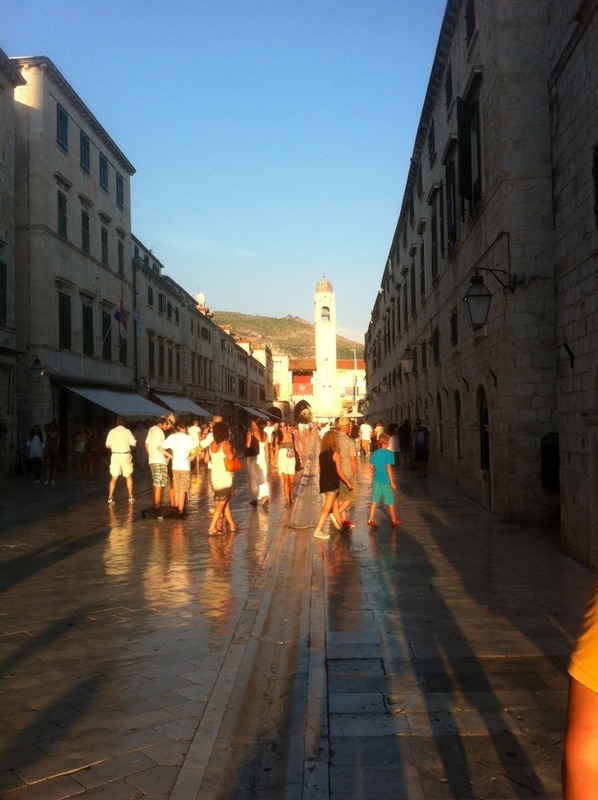 Arriving at Dubrovnik the light was utterly amazing – and what an awesome place – I managed to light a candle for my dad in the Cathedral here as, unbelievably it is exactly one year ago today that he died. Still time to catch up on some work stuff and to hear that the Mysteries and The Space project are progressing really well indeed. So a big thanks to all the Pilot / York / Kinura teams. We are back to work on Monday and it will be all systems go. But in the meantime batteries are being recharged and we are going to make the most of the two day break in this beautiful city.